The Export to Easel JS dialog allows you to export your game character as a sprite sheet, in which each animation frame in your scene is rendered as an individual sprite. Since the Export to Easel JS dialog renders each frame in your scene, there will not be any visible difference between the way your character is rendered by Harmony and how it is rendered in your game engine. Contrary to the Export to Sprite Sheet dialog, the Export to Easel JS only outputs a sprite sheet and an XML document delimiting each sprite in the sheet. Hence, they cannot be imported into Unity using the Harmony Game SDK package. You must program the logic to import those sprite sheets into your game engine yourself. The Export to Easel JS dialog does not export anchors and props. To export to Easel JS, you must separate your animation clips using scene versions. The Export to Easel JS dialog will not export separate animation clips if you have separated them using scene markers. Fully rendered sprite sheets are much heavier in size than rigged sprite sheets, which is what the Export to Sprite Sheet dialog exports. Click the Export to Easel JS button. The target directory in which to export your sprite sheets. The name of the folder in which the spritesheet and its metadata will be saved. This folder will be located inside the Save Path folder. If it does not exist, it will be created. This will also be the name of your asset in Unity. If you already exported clips for this character, this will display the list of clips that already exist in the target directory. The Display from which to render your character. If the Unconnected_Display option is selected, all of the visual information in your scene will be rendered. NOTEYou can only create Displays in Harmony Premium. The maximum width, in pixels, of the exported sprite sheets. The maximum height, in pixels, of the exported sprite sheets. Creates sprite sheets in the smallest possible size to contain all the sprites, up until it reaches the maximum width and height. Creates a texture of the specified size (Max Width and Max Height) even if it does not fill it up completely by all the drawings in your scene. This option works in tandem with the Threshold option. The export will compare the drawings in your project to reuse a maximum of similar drawings and reduce the amount of information found in the sprite sheet, making it lighter. The export will omit the creation of new drawings if the difference is less than the threshold percentage. Calculates the differences between multiple drawings. A 2% threshold will prevent the creation of a new drawing if the drawing is too similar to an existing drawing. For instance, with a 2% threshold, and my drawing is 100 pixels big, only 2 of those pixels need to be different from my other drawing in order to create a new one. The higher the threshold, the fewer similar drawings you will have. Allows you to add a resolution in which to export your sprite sheets. Removes the selected resolution from the resolutions list. 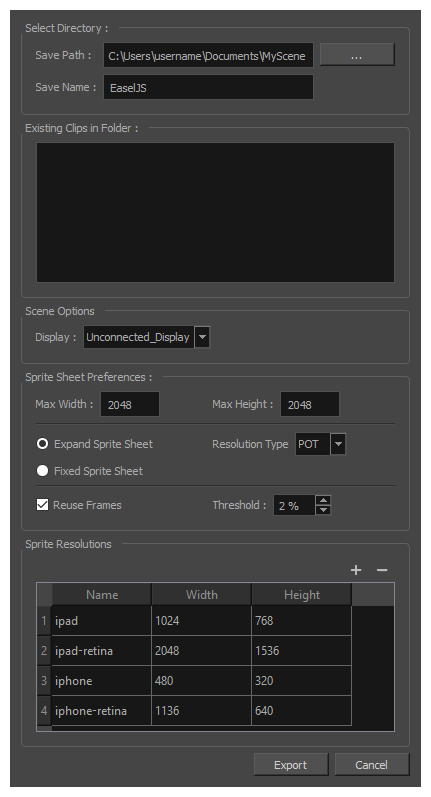 The list of resolutions in which the sprite sheet will be exported. The whole sprite sheet will be rendered once for each resolution in the list.